The new AirModulator 2 and AirBooster 2 units from STULZ are deployed in the raised floor directly in front of the server rack in just a few simple steps. They utilize the same air conduction system from the air-conditioners to the racks and are controlled exactly in line with cooling needs. Fast, simple and reliable. The air stream of the AirBooster 2 units can be directed at 2 zones per server rack. Depending on the utilization of the server, the manually adjustable air conduction fins can be used to steer the air conduction towards the areas with the heaviest load. Server racks deployed in a data center feature different heat loads according to the application. In this era of server virtualization and cloud technologies, changing utilization is the requirement that has to be addressed. In the case of fluctuating heat loads in the data center, certain server racks are cooled more than required and this can lead to unnecessary operating costs. 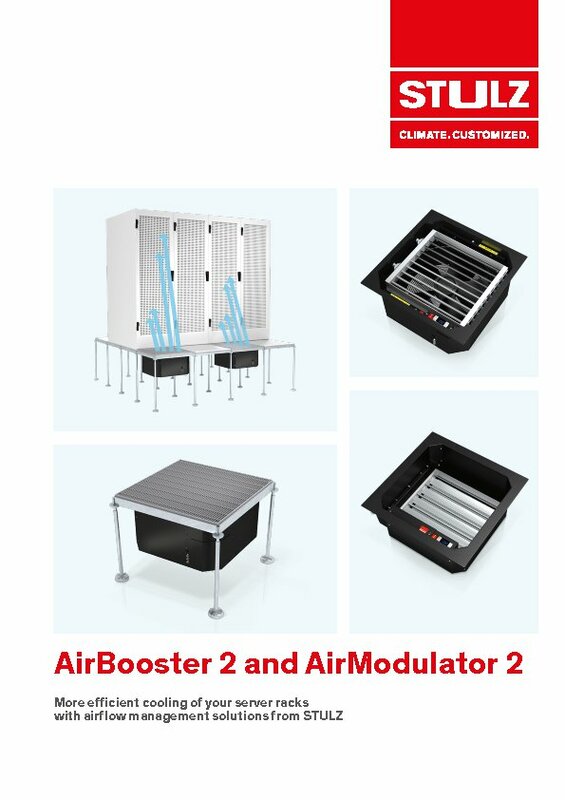 In data centers that feature a sufficient air supply in the raised floor and in which cold and warm aisles are not separated from one another by structural measures, the AirModulator 2 units are an efficient solution. Thanks to the targeted supply of cold air directly in front of the servers, the mixing of cold and warm air is reduced and this significantly increases the energy efficiency.